PDF Creator is a PDF creation software which initially installs as a type of virtual printer on your Windows PC. 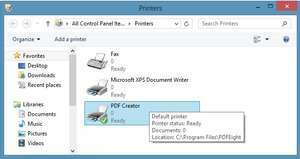 In doing so, PDF Creator allows users to create PDF files from virtually any type of program running on Windows which has a print (CTRL P) function. As with traditional printers, this application allows users to create pages by specifying page size, colour depth, page zoom scaling and also goes a step further by allowing users to embed fonts as a separate function. From the print menu, this virtual printer driver allows its users to change the page orientation, down-sample and compress images and can also apply password-protected encryption to the PDF files it creates. PDF Creator for Windows 8.00 is a shareware program and can be used as a demo to try the software until the free trial period has ended. A full version of the program is available after the trial period ends. For security reasons, you should also check out the PDF Creator for Windows download at LO4D.com which includes virus and malware tests. Additional screenshots of this application download may be available, too.